Minneapolis and St. Paul are very bicycle friendly cities. In our world where bicycles and cars often share the same road, key safety measures should be taken to guarantee the safety of all commuters. As drivers we must be mindful of our cycling friends and as bicyclers must also pay attention to the rules of the road. If either vehicle fails to take the rules and regulations into consideration, the result could be tragic. Below, we've compiled some helpful tips to make road sharing just a little easier and safer. As Minnesota bicyclists, we are still held to the same rules of the road as motorists; that means stopping at red lights and abiding by all other traffic laws. For more information, The League of American Bicyclists has great information about traffic laws and other important topics. 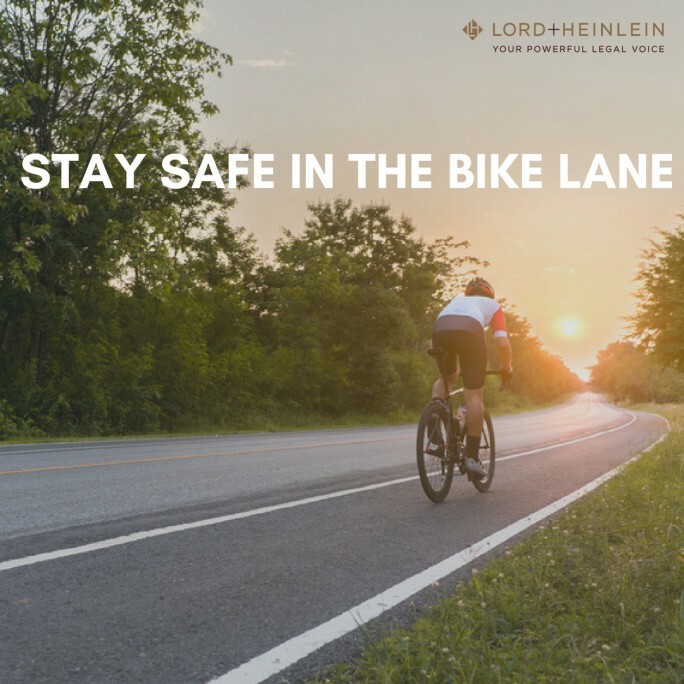 As cyclists, we are not equipped with many safety features, so it is always advisable to ride in protected bike lanes when available and ride defensively if they are not available. And, although it is not the law in Minnesota to wear a bicycle helmet, it is to always advisable to do so. If you are in a collision, a helmet will often be your first and only line of protection from the devastation of a traumatic brain injury from a bicycle crash. Moreover, always ensure that both you and your bike are visible. This means wearing highly reflective clothing at night and during cloudy low-visibility conditions as well as being equipped with adequate lighting. Time of day, weather conditions, and other obstructions can make it hard for motorists to see bicyclists; so, the more visibility you can create for yourself, the better! For more information about adequate lighting for bicycle commuters, please check out this helpful article. When driving in Minneapolis or St. Paul, Minnesota, you'll most likely encounter a bike lane or bikers riding alongside you. When this happens, it is pivotal that you provide bicyclists with enough space to maneuver. Always keep at least three feet of space between you and the cyclist on all sides. When attempting to pass a bike commuter, patience and awareness is key. Always check your blind spot and rear view mirror for the presence of bikers. Also, take a moment to observe the road in front of both you and the cyclist to ensure that they will not be put in a dangerous position while you are passing them. Be particularly aware of this possibility if there are snowy conditions, as snow buildup on the side of the road or in bicycle lanes can create unforeseen hazards for bicyclists. Wait until oncoming traffic is clear before merging to pass a cyclist to ensure that you are able to provide adequate space between you and the bicyclist while passing. For a myriad of reasons, changing lanes is not always possible and sometimes it's necessary to ride alongside or behind a bicyclist for a short time. If you find yourself in this situation, exercise patience and caution and you'll be cruising again in no time. Though sharing the road with one another can be frustrating for both drivers and cyclists, we can all have a pleasant and safe experience if we remain patient and follow the rules of the road. As long as bicyclists are easily visible and motorists exercise safety and courtesy, we can coexist safely on the road. If you or someone you know is injured in a car or bicycle accident, reach out to us for a free consultation. I am not afraid to fight big insurance companies to get you the compensation you deserve and I am personally invested in every one of my cases. At Lord + Heinlein, we are your powerful legal voice.